"Nefyn Shipbuilders and their Ships"
I feel it would be appropriate at this juncture to write a little about shipbuilding at Nefyn, which for practically a century dramatically changed the life of the town and its inhabitants. The turmoil of the Napoleonic war created a great demand for shipping to supply the army’s needs particularly in the Mediterranean. Nefyn mariners became much involved in this campaign which not only was to their financial advantage but fostered their skills and confidence. Captain John Jones of the brig ‘Elisabeth Bowen’ for example, had an unforgettable moment of personal glory after being instructed to report in person to the House of Commons about the latest developments at Sebastapol, ‘Margery’ and the ‘Mary Watkin’ were two of the many other local ships employed in this venture. Britain at this time was also busy building an overseas empire and establishing an enormous lead in trade with other countries, which led to rapid growth in the Merchant Navy for exporting and importing raw materials to satisfy the voracious appetite of the booming factories. Another important factor in this growth was the flood of people emigrating to America, New Zealand and Australia seeking a better life, and countless men seeking their fortunes in the gold rushes in various parts of the world. This growth was also accelerated from the demands from the rapidly growing industrial towns for the locally produced roofing slates, which the builders found more durable and safer than the previous thatch. 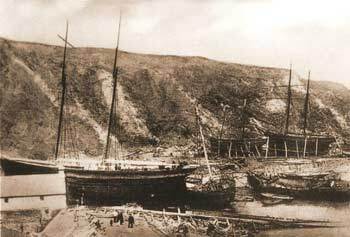 The astute business men of Llyn scenting profit took advantage of the situation by encouraging the building of larger wooden ships and enlarging the old ones, with more craftsmen moving to live in Nefyn, the increasing population added to the prosperity of local businesses. As time went by this insatiable demand for new ships could not be met by these yards, forcing owners to buy ships from such places as New Brunswick, Nova Scotia and Prince Edward Island. These new ships were much larger, of the order of 700 to 1000 tons, which had a marked effect on freight rates. Local ship workers sarcastically called these ‘foreigner’ or ‘cut price ships’ because they were built with green or unseasoned wood making them liable to ‘open up at sea’ with possible calamitous results. These new elegant ships affected the design of Nefyn ships, with their bows becoming sharper and their flair improved making them faster and more maneuverable. These early ships at Nefyn were constructed not from plans but scale models, and furthermore in an area that was completely Welsh in language, surprisingly all the terms used in this industry were in English. Pwllheli and Nefyn were considered to be cheap places for shipbuilding, the extra cost of importing materials more than compensated by the low wages. In 1851 there were 256 men employed and were paid 2/- to 2/6d per day with an extra sixpence for the wear and tear on their tools as the timbers on the old ships had become very hard with age. Sails, anchors, chains etc were brought in from Liverpool or Bristol, but by 1838 ropes began to be made locally in rope-walks called locally ‘ropogs’. These ships were invariably built on the seashore, which could take two or three years. They were built with shallow drafts because in the absence of quays around the coast, they could be sailed directly on to the beach, and after being unloaded, be easily floated out on the next high tide. The original ships were described as ‘short, bluff nosed, short stern, tub like and slow’ because durability was considered more important than elegance. In the beginning they were built entirely of oak and were exceedingly strong so they could withstand the enormous stresses and strains of carrying heavy cargo in stormy weather. The oak used for their construction were rafted across the bay, or brought in ships, from Maentwrog, but following the demand of the Royal Navy in wartime, this supply was soon exhausted. This dearth led to timber being imported from the South of England but this too proved to be insufficient and in the 1820’s Nefyn builders bought their timber from Scandinavia. The considerable finance required to build these ships in the absence of powerful institutions was provided for by local people such as preachers, quarrymen and shopkeepers who were all filled with a fervent hope of having a good return on their hard earned money. This investing fever swept through the country villages such as Bethesda which held the complete shares in one ship. Each ship was divided into sixty four shares, which were offered for sale to the public, four shares were called an ounce. The captains and their families were always offered the first option, and consequently became substantial holders, but merchants outside Nefyn involved with these ship’s cargoes, always scenting profit, became active investors. John Morgan of London held a half share in the "Ocean Maid" and John Dean of Blackburn held sixteen shares in the ‘Velinheli’. Interestingly, the local landed moneyed class, apart from the quarry owners, showed no interest in investing in these ships, being more interested in developing railways. There was no organised agency for selling these shares, which would be advertised by word of mouth, but advertisements did sometimes appear in the press. In ‘Wales and the Sea’(1977) a marine periodical there appeared a copy of such a sale held at Cardiff towards the end of the nineteenth century, when the ‘Mary Ann’ was offered for sale together with half a share in ‘William the Fourth’ and an eighth share in the schooner ‘Hope’. The price paid for these shares depended on the ship’s age, history of its profitability and it’s condition, important factors that these cautious investors careful consideration. In modern parlance these investments because of their high losses and the fickleness of world trade were ‘high risk’, the final deep recessions in the 1880’s made many a shipping company bankrupt and cost Owen Griffith dearly. In a time of great religious zealousness with gambling frowned upon, these investments were amazingly tolerated with no comment !! It could be highly lucrative with one’s investment being returned in three years, a 25% return was quite common. The ‘Maria Catherine’ of Nefyn earned £387/0/5d in one year, dispersals were £135/18/0d, wages £70/16/0d leaving a grand profit of £172/10/0d. The infamous and scathing Education Report of 1847 giving a supposedly detailed report on the standard of education did nothing to boost Welsh confidence, when it stated that monoglot children and sailors were most ignorant, and opportunities for education was poor. The qualifications of the teachers was also condemned and treated with much disdain. In view of the dearth of education facilities in the early part of the last century, tuition in seamanship and navigation for these sailors was most difficult to obtain. Fortunately several talented local men such as James Griffith, a headmaster and John Ellis, Ty Cerrig, Nefyn started giving lessons in simple mathematics, enabling potential officers to cope with navigation problems and to keep a ship’s book. As early as 1803 the Rev Michael Roberts, minister of Penmount Chapel, went to Liverpool to undertake a course in navigation, but probably the most famous of these teachers was Mrs Edwards of Caernarfon a captain’s widow, and her daughter, with one of her pupils appointed captain of the ‘Mauritania’. Payment for fees for these course varied, Hugh Davies, Nefyn charged £1 for passing the second mate’s certificate examination and £2 for the first mate and £3 for passing the captain’s, it was payment by results. Launching a ship was a most important social event in these seaside towns, to which everyone looked forward to with great excitement, and was considered by everybody as an unofficial public holiday. The headmaster recorded many times in the school log that on such occasions and at harvest time he had to close the school because it was impossible to get children to attend. On the previous day of the launch workers would be employed to open a large trench from the stern of the ship to the sea to facilitate an easy passage at the following high tide. The launching would start with a traditional religious service of blessing, and it was a signal honour for any minister to be invited to undertake such a ceremony and a reflection on his preaching capabilities. 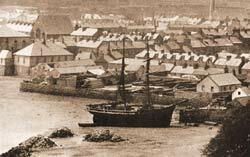 An appropriate text would always be chosen, for example during the early part of the last century the Rev John Jones took as his text for a ship leaving Porthdinllaen with emigrants for America, ’But now they desire a better country’ Hebrew chapter 11 verse 16. The Welsh invariably appear to see a problem in every answer, and so it was during the last quarter of the 19th century when a serious tide of teetotalism swept through the land. This created a most serious and prolonged theological debate about the breaking of a bottle of alcoholic drink during a launch. The ‘saints’ considered alcohol because of it’s abuse and the ensuing social consequences, as the invention of the Devil himself, and the saints were only placated with this problem by the substitution of non alcoholic wine. The situation was to say the very least hypocritical, because as soon as the ceremony was over, the proud owner would invite everyone to partake of a lunch with plenty of ale at a local hostelry, while, he, with his chosen guests would celebrate the occasion at a superior establishment with fine wines and spirits being generously imbibed. It is worthy to mention part of Pwllheli’s folklore regarding another famous launch a ‘Seiat Feddw’ (drunken religious meeting) which created at that time such a furor in the town, and is still referred to with no little embarrassment. This event occurred after the completion of one of the largest vessel built at Pwllheli named after William Carey, a noted missionary, and was owned by William Jones, a prominent Baptist and ship owner. William Jones had foolishly issued a crew list for this new ship, which included only some of the ship’s workers, causing bitter resentment in the ones rejected. Jones ordered all the workers to attend a religious blessing on his new ship at Penmount chapel, but to his and the town’s astonishment the rejected men refused to obey and adjourned to a local hostelry to drown their sorrows and disappointment rather excessively. This unwarranted act rejecting the authority of the Almighty and rebelling against their employer so contrary to the traditional of the town, invoked so much consternation and disgust amongst the town’s people, that it is still shamefully talked about a hundred and fifty years later. Captains worked their crews and ships very hard, resolutely navigating the High Seas with doubtful charts, but as many of these early captains were illiterate they had developed an uncanny sense of direction aided by coastal prominences, the colour of the sea, the presence of birds and kind of seaweed etc. Sailors suffered enormous amount of fatalities and injuries e.g. to climb a violently oscillating mast working themselves along a spar in a storm clinging desperately with one hand and gathering in heavy wet or frozen sail with the other, balancing on a single rope under their feet which separated them from certain drowning, demand courage. Some avaricious captains added to the dangers by continuously overloaded their ships, a practice that only ceased with the introduction of the ‘Plimsoll Line’ in 1876. Such living conditions made these mariners tough, independent and determined men, qualities that became more evident during the national emergency in 1589, the Armada year. The Board of the Admiralty issued orders that all sailors between 16 and 65 years of age were to report at a convenient time to register their names to the Vice Admiral of North Wales, namely Sir John Wynn of Gwydir, but in reality it was to a local JP. They were further charged that under no circumstances were they to leave their homes, and be prepared to leave at three hours notice. Absent sailors were to immediately report when they reached home and were not to leave. Nefyn men treated these orders issued by complete strangers with contempt and ignored them completely. This rebellious state to the authority of the crown, forced the local magistrate into appreciating that the situation was hopeless, and he abandoned his duty, forcing Sir John Wynn himself to come to exert his authority. His untactful arrival on a Sunday only strengthened the resolution of the men, and further antagonised the whole town. A typical voyage for these ships was to sail from Caernarfon or Bangor with a cargo of locally produced roofing slates to Hamburg and then proceed with a fresh cargo across to America, completing their trip by going to Newfoundland to load with dry fish for Spain, where often they had to wait weeks for the fish to be caught and dried, and then finally returning with a cargo of citrus fruits to the UK. They also often sailed directly to America with slate returning with a cargo of cotton or with a cargo of foul smelling guano, a popular fertiliser before the invention of artificial ones. 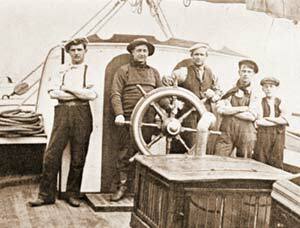 There were many instances of a small ship with a crew of only a captain and a boy sailing the Atlantic carrying slate, but on arrival at the American coast, they had no idea where they were and had to sail along the coast to reach their destination. The very stressful life style of these captains left a lot to be desired and many died young. They had to be at the helm of their ships for hours, if not days in stormy weather, and were always burdened of their inescapable responsibility for returning good financial returns for their shareholders. They were responsible for keeping discipline aboard as well as attending to some horrendous accidents that occurred aboard. Captains reacted to these conditions in many different ways, some became alcoholics and others quite eccentric, such as the captain that ordered he should be buried at the nearby Pistyll cemetery in a vertical position, as he could walk out of his grave on the great day of resurrection!!! Some developed an interest in various hobbies and some acquired expert knowledge in many fields by their extensive reading at sea, but surprisingly very few of them kept diaries. These captains were constantly worried about keeping the costs down to increase the ship’s profits that they were determined for example, to save the high fees charged by pilots particularly those on the Thames that they undertook the onerous task themselves. To sail up this crowded river at the mercy of the wind and tide by day and night required great courage and skill. The lot of these sailors was a very hard one, a typical picture of one’s estate can be seen in the following Grant of Administration to a John Griffith (no relative!) in 1824 to his wife Jane Griffith. There is no date of death implying that he was drowned at sea. With the advent of the larger steel hulled ships and the development of marine engines leading to faster, more reliable and cheaper freight charges, demands for the ageing wooden ships declined and ship building at Nefyn ceased completely in 1880, bringing an end to a period of great activity, excitement and regretfully many tragedies. To conclude perhaps a few words about the incommensurate belief many of those early sailors had in superstition. It was an age when even responsible members of society believed in the existence of fairies and spirits, while those people considered to have supernatural powers to predict and control the future and help people in their difficulties, were always treated with respect and a degree of fear. Sailors because of their dangerous work were very prone to these influences and a feeling of being lucky was of fundamental importance to them, to sail on a lucky ship with a lucky captain was essential to their peace of mind. While on dry land these sailors were reverent Christians but once over a harbour’s bar they felt affected by the primitive Gods of the sea. At the bar at Porthmadog’s harbour there was a black buoy on which it was reputed sailors as they sailed by threw their coats of respectability. This symbolic act allowed them to fully enjoy the readily available pleasures in foreign ports without disruptive conscience, but on their return these imaginative coats of respectability would be raised before they rejoined their families. Incidentally, the incidences of various imported diseases in this area appeared to have been low, the poor monotonous diet, fatigue together with probably a touch of religious conscience, appears to have been an effective prophylactic. The breaking of a wine bottle at a ship’s launching ceremony was considered by sailors as a baptism, and by others a sacrifice to the Gods of the sea. To ensure a safe voyage a sailor would often arise at dawn on the morning of his departure and go down to the dock to touch the bow of his ship, others would spit on a coin and throw it over the side. Seeing a clergyman on the way to join his ship was considered a bad omen, and they would return home, which I can imagine would be most awkward if the ship was to sail on the next tide. Likewise if they had forgotten some article on their way, they would never return home to collect it, somebody had to run after them and place it in their hand as they walked. A sailor’s wife would never come to the quay to wave goodbye, because they considered that it could be their final meeting. Whistling was forbidden on board except when the sea was calm and wind was required to fill the sails, otherwise they thought a severe storm would ensue. Wearing women’s clothes was forbidden !!! Sailor’s considered that changing a ship’s name changed it’s luck a new name ending in the letter “a” would be always viewed with suspicion e.g. Lusitania. Ships were always referred to as "she" who had a soul incorporated in the ship’s figurehead, and when that was above water, they firmly believed the ship would never sink. The cutting of their hair and nails was forbidden on board as well as using certain words e.g. salt, salmon, egg and on hearing such words a sailor would immediately touch a piece of iron to restore his luck. The wearing of gold earrings was not a big fashion thing, but they hoped their value would, should they unfortunately drown in foreign waters, pay for a Christian funeral. Sailors felt that it was impossible to fight the power of the sea and they would refuse to rescue a shipmate from drowning because they thought that the sea was calling for a sacrifice, the denial of which would lead to their early demise. A cowl from a newborn baby was considered as good insurance from drowning, in the ‘Times’ of 1812 there appeared one for sale for 18 guineas, indeed, a very high price. Ship building did not escape these practices, for example, staring to build a new ship would never occur on a Friday, and the first nail used in its construction would always have a red cloth around it to keep the devil away. Lucky woods such as ash would always be incorporated in its frame as well as a coin to ensure added luck, with the inevitable horseshoe fixed to a door or mast. There are countless other practices by sailors, which could be considered as pagan, but that’s the way it was, and some have persisted to this day!!! Thanks to Mr O J Cowell, Pwllheli, for this brilliant account of Nefyn and its history.